Codepink organizers held a news conference in Oakland, California this week responding to Obama's request for yet another Authorization for the Use of Military Force (AUMF), this time against "the terrorist organization that has referred to itself as the Islamic State of Iraq and the Levant and various other names (in this resolution referred to as "ISIL")." 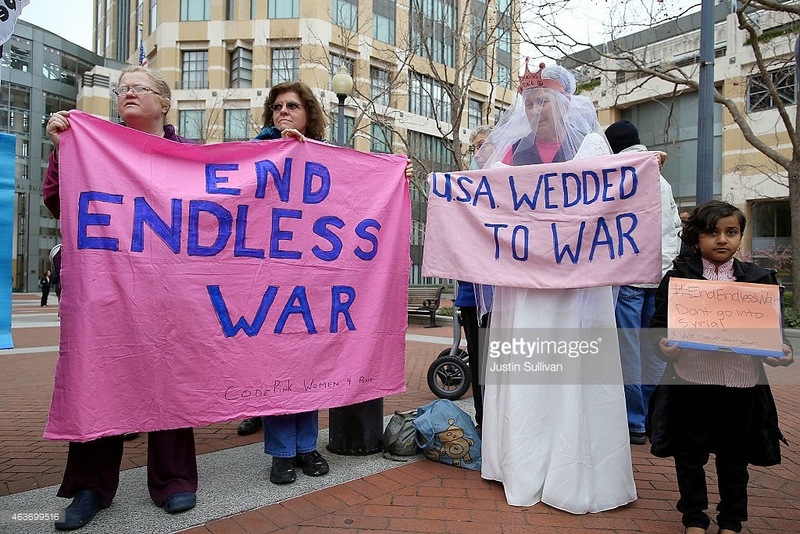 The myriad reasons why another AUMF is not a good idea have been ably detailed by Codepink's Janet Weil. CP: The most important causes of Americans’ untimely deaths are heart disease and cancer, followed by suicide and road accidents. Death by terrorist attacks doesn’t even make the top 50. Our security would be improved by better healthcare, including mental health care and suicide prevention; reduced income inequality; and safer roads -- all underfunded because about 60% of the discretionary federal budget goes to the military. Of course, Obama is lying. As Commander-in-Chief his highest priority is serving the interests of the corporations who profit from the death dealing that comprises the bulk of U.S. manufacturing capability in the 21st century. The corporations that put him in office, that is, and will put his successor in office -- the successor who will have a handy AUMF in his or her back pocket immediately upon assuming the role of celebrity spokesperson for the military-industrial complex. What about we ordinary mortals here on the ground -- why would we want a new AUMF to be issued by Congress? Let me illustrate with an anecdote from one of the poorest rural school districts in the poor, rural state of Maine. A teacher who formerly worked with functionally illiterate adults was approached by a former student in the grocery store. The student said that he remembered her because years before she had helped him be able to read just about anything, and this ability had changed his life. He was grateful to her and wanted her to know that he had gone from being barely employable to being a huge success -- a head welder at Bath Iron Works! BIW is the pinnacle of employment opportunity for working class men in Maine. An historic shipyard with deep ties to the Navy, it is now owned by the General Dynamics corporation and turns out the battleships called destroyers with alarming frequency. (What or whom they will destroy never seems to concern my reps in Congress, who always show up to pledge allegiance at each new "christening" and launch.) 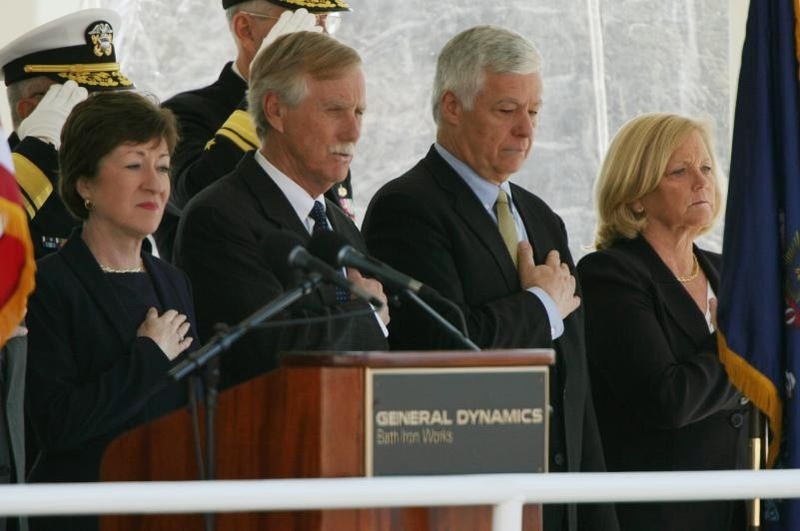 Pentagon contracts need to keep rolling in to create jobs at Maine's largest single employer -- or so we are told. BIW is about two hours by car from the community where the welder lives with his family. I would imagine that his kids put up with his long absences yet brag about his job at BIW, as I have heard many students do over the years. There are precious few jobs that pay a living wage in Maine: working in a paper mill or shoe factory or textile mill used to compete, but there aren't many of those left. Young people with ambition generally leave the state; many join the military. This is what a war economy does to its people. It's not a new problem. Imperial Japan starved its population to feed its war machine, as people in Tokyo explained to me when I lived there in the 1980's. Nazi Germany imprisoned and exterminated millions of Jews and used their resources to occupy Europe. Turkish oligarchs created their new nation from the ashes of the war-exhausted Ottoman Empire by stealing from Armenians destroyed in that genocide...and so on. The German playwright Bertholt Brecht created a great play about the problem. Writing in Europe during the rise of 20th century fascism, he set the action of Mother Courage and Her Children amid an historic war that seemed endless. Mother Courage feeds herself and her children by following the army with a canteen wagon, doing business with the war machine with one hand while using her other to keep her children safe. Ultimately, she fails. Son #1, vain and proud, is easy prey for the army recruiter. Son #2, a clever boy, is pressed into service as an army payroll clerk -- and then thrown under the bus when the corruption of his boss comes to light. The only daughter is traumatized by the sexual violence that ever accompanies war and rendered mute. But, she sacrifices her own life to sound a bell that warns civilians of an impending sneak attack. At the end of the play, the grieving mother continues alone, still selling meals to fuel the war that has consumed her family. Because how else do you make a living when a war economy is all you've got? Ok, instead of welding or selling sausages at BIW you could work for the corporations that make the propaganda or help corporations evade taxes or force genetically modified food on subject nations or sell fracked "natural" gas or tar sands oil. You'll need to work for The Man one way or another in order to pay off the thousands of dollars of student loans that allowed you to get a college education. 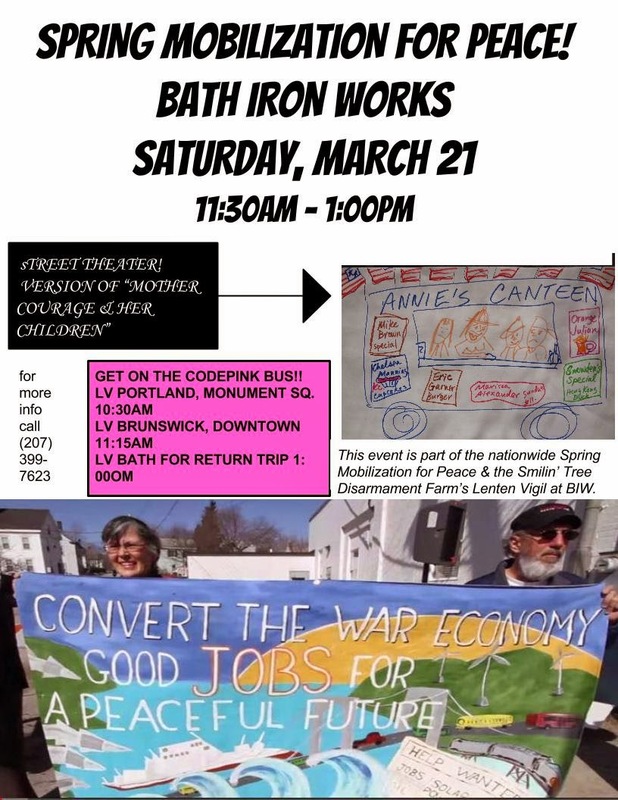 Join the Spring Mobilization for Peace with a street theater performance of a version of Mother Courage aka Canteen Annie on Saturday, March 21 outside the gates of BIW in Bath, Maine. RSVP here or on facebook.